This is such a refreshing salad; sweet, salt, bitter and spicy by turns. It makes a light lunch for two people or a starter for four and it’s as good in winter as in summer. It’s a movable feast. You can vary the salad stuff, although I like the snap and slight bitterness of the chicory, and of course leave out the ham if you don’t eat meat. But do please try the burnt oranges (an idea I nicked from the lovely Sabrina Ghayour’s latest book, Feasts) and the spiced walnuts. They lift this salad out of the ordinary. 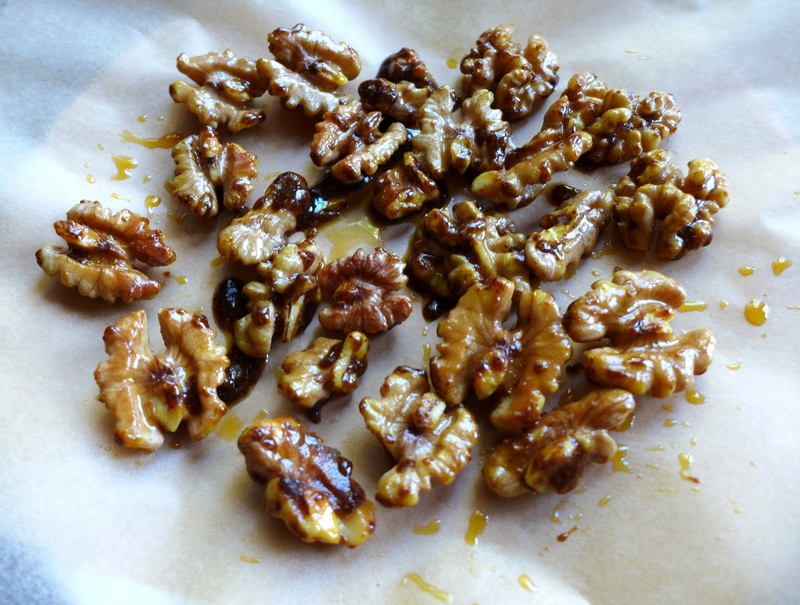 For the spiced nuts, heat 1 tbsp oil in a frying pan and toss the walnuts to coat. Sprinkle over the cayenne, cumin, coriander and salt. Add the honey and stir well, making sure the walnuts are well coated. Remove from the heat and scoop onto baking paper to cool. Over a plate, peel the skin and pith from the orange and cut out the segments, discarding the pips and reserving any juice. If you have a blowtorch, place them in a heatproof tin and scorch both sides until you have blackened tiger stripes. Otherwise, heat a pan, pat the segments dry, coat with a scrap of oil and quickly scorch them on both sides. Carefully remove to a plate and set aside. Pour a tablespoon or two of dressing into a salad bowl. Break off the chicory leaves, slicing in the stalks finely as you go, and add to the bowl with the lambs lettuce. Toss to mix. 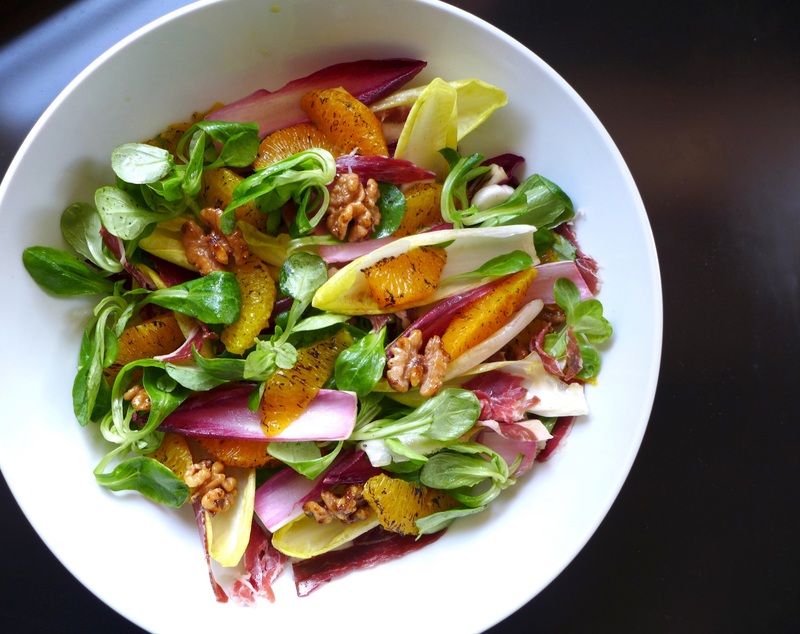 Mix in the spiced walnuts and Serrano ham, then scatter with the burnt orange and serve straight away. 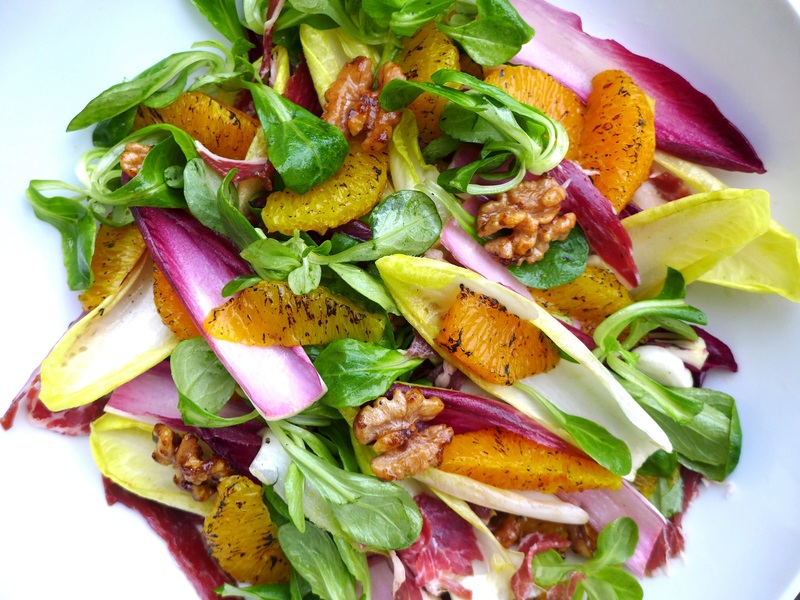 This entry was posted in Vegetables and salads and tagged burnt orange, chicory salad, lambs lettuce, salad with burnt orange and spiced walnuts, spiced walnuts by Linda Duffin. Bookmark the permalink. Wonderful salad ! Those burnt oranges caught my attention !! That does sound great. 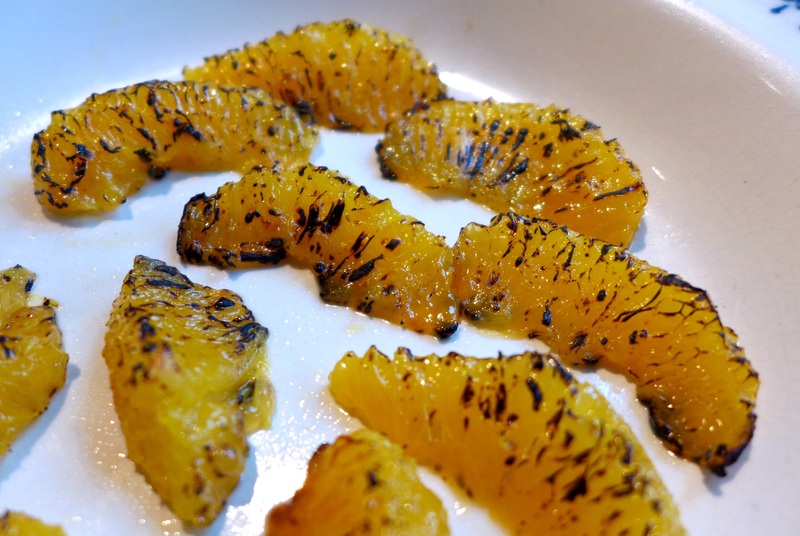 I never thought to sear oranges but I can see how it would work. Just stunning! I imagine those roasted/burnt oranges are incredible. This does sound intriguing. Burnt orange has such a nice ring to it, as do the spiced walnuts. And the serrano ham, of course. Some of my favorite tastes in one plate. Sounds like a winner.